Almost every entrepreneur has heard about the acronym, SWOT. It stands for Strengths, Weaknesses, Opportunities and Threats. Typically the SWOT analysis is used as a corporate assessment. We gauge each of these areas relative to our own businesses and then create strategies to respond accordingly. 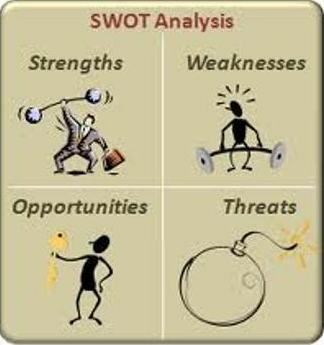 But there is another application of the SWOT analysis that I’ve rarely (maybe never) heard utilized. And that is to perform a personal SWOT analysis. As the entrepreneur, it is a good practice to self-perform the SWOT. But it would also be enlightening to have a peer or trusted colleague do the same to gain an additional perspective. We start this process by analyzing our personal Strengths. Are we strong leaders – if so, how is this demonstrated? Are we persevering? Do we have exemplary resilience in the face of adversity? Perhaps we have a strong innovative flair. Could we safely say that we are calm, patient, kind or generous? We should identify and assess the strengths that matter most. Seeing our Weaknesses may not be so easy especially if we aren’t an introspective type. This may require help from that trusted colleague or a peer who isn’t afraid to tell it like it is. Do we have a temper? Does our ego ever get in the way? Do we always treat others with respect? Are we perceived to be of high integrity? Do we give up too easily? Maybe we have a tendency to lose focus. Analyzing our Opportunities is an exercise in determining whether our glass is half empty or half full. Think about what we personally have the potential to do. Could we become more philanthropic? Is there a mentoring or coaching opportunity in our future? Do we begin speaking at industry conferences? Perhaps we could develop a new product or service. Ultimately this is about how we can become more fulfilled as human beings as well as becoming even more valuable to our enterprise. Finally we must look at our Threats. Could our lifestyle be a threat to our health? Is there a lurking situation that could degrade our financial security? Does our mindset work for or against us? When we evaluate Threats in a corporate sense we generally are contemplating external pressures that we may think are beyond our control. As we consider Threats from a personal standpoint we find that most will be of an internal nature. We can be our best friend or our worst enemy. Once we complete an honest and realistic personal SWOT assessment, we need to take the next step of creating strategies that bolster our Strengths; resolve our Weaknesses; take full advantage of our Opportunities, and eliminate our Threats. The ensuing plan can become the centerpiece for leading a balanced work and personal life. And revisiting it often will ensure its implementation. A personal SWOT analysis can be an invigorating and exhilarating process. When done in concert with a SWOT for a company, the results can be a powerful catalyst for positive change in both the entrepreneur and his or her enterprise. This entry was posted in Entrepreneurship and tagged Entrepreneurial Spirit, Entrepreneurs, Entrepreneurship, opportunities, Strengths, Threats, Weaknesses by anentrepreneurswords. Bookmark the permalink.